Photography by Stephanie Partridge, APD of The Behaviour Beet. Follow her on Instagram for more stunning photos! I wrote about pulses a few months ago and why they are arguably my favourite ingredient. You can check that post out here, or just take my word for it and start eating more pulses A.S.A.P. Recap: Pulses include dry peas, beans, lentils, and chickpeas; which are jam-packed full of protein, complex carbohydrates, antioxidants, and minerals. 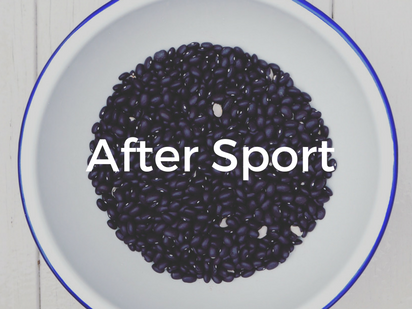 Why should athletes eat more pulses? Pulses are high in complex carbohydrates that offer athletes a sustained source of energy. Compared to eating simple carbohydrates (like those found in fruits, grains, starchy vegetables, or yogourt/milk), eating pulses results in a slower and more prolonged rise in blood glucose levels to fuel your muscles over several hours. There is also some evidence to show that they can promote the use of fats by the muscle, thereby preserving muscle glycogen. That being said, pulses are also slower to digest and can increase the risk for gastrointestinal (GI) distress if they are eaten too close to your event. Foods higher in simple carbohydrates, and lower in fat/fibre are typically the preferred choice for a meal or snack closer to the time of your activity since they are less prone to cause GI upset. So, moral of the story…balance is key. Aim to include pulses in your pre-event menu when you have two or more hours to digest before your event (you can top up with simple carbohydrates thereafter). The inclusion of pulses before activity is especially helpful if you have limited or no opportunity to consume carbohydrates DURING your activity – this way you can promote a more sustained release of sugar into the bloodstream and prolong your muscle stores. As always, make sure you experiment with your pre-event meals in training to see what your body tolerates – never try something new on competition day! Exercise is a form of stress on the body. In order to properly recover you need to rehydrate, refuel your muscle carbohydrate stores, repair your muscle protein, replenish your body’s antioxidant pool, AND support your immune system. All of the above can all be accomplished with FOOD, including pulses! Decrease inflammation - pulses are high in antioxidants such as vitamin E, selenium, phenolic acids, lignans and isoflavones that help reduce inflammatory processes, thereby increasing your body's capacity for healing. Immunity – pulses contain resistant starch and oligosaccharides (e.g. raffinose) that feed the health-promoting bacteria in the large intestine. Your gut bacteria play a huge role in maintaining your immune system...so you've got to keep them fed and happy! Pulses are rich in potassium (K), magnesium (Mg), and iron (Fe). Three nutrients that athletes want to get MORE of. Potassium is an electrolyte that helps regulate muscle contraction, blood pressure, and heart rate (some pretty key body functions for an athlete if I do say so myself). You lose potassium in your sweat - make sure to replace it with foods like pulses to prevent poor performance. DYK that a 1/2 cup of cooked dry peas contains just as much K as a banana? Magnesium is a mineral that contributes to nerve impulse conduction and muscle contraction. Top up your stores by eating pulses to prevent muscle cramps. This is especially important if you have a high volume training load (e.g. long distance runner) or a restricted calorie intake, as you may be at risk of Mg deficiency. Iron is a key component of red blood cells that helps deliver oxygen to working muscles. Even a mild shortfall in iron status can reduce your endurance capacity. Pulses contain non-heme iron, which is less available to your body than heme iron found in meat, poultry, and fish. But you can increase the iron your body absorbs from pulses by pairing them with a source of vitamin C. Vitamin C rich foods include citrus fruits, cantaloupe, honeydew, kiwi, berries, broccoli, cabbage, cauliflower, kale, peppers, potatoes, and tomatoes...to name a few. Substituting some of the animal-based protein in your diet for plant-based proteins (i.e. pulses!) can help to reduce your saturated fat and cholesterol intake, and improve your cardiovascular health. Read more about the types of dietary proteins here. Because pulses are excellent sources of dietary fibre, including soluble fibre, they help to promote feelings of fullness and satiety after a meal so that you do not overeat or feel hungry too soon afterwards. Thereby, helping with weight management without even thinking about it. Yes please! Eating pulses can produce extra gas in your guts, which can cause gastro-intestinal (GI) upset for some people. This happens because the complex carbohydrates in pulses are not absorbed and are instead fermented by the bacteria in your colon, who produce the gas. Eat small amounts of pulses, and gradually increase your portion sizes over time. This will allow your gut to get used to digesting them. Eat pulses often. This allows your gut to adapt to the higher fibre and complex carbohydrate content, thereby decreasing GI side effects over time. Include pulse in meals/snacks when you have at least 2 hours to digest before your activity. Soak dry pulses overnight (check out how to soak pulses here). Rinse canned and pre-soaked pulses before cooking. Cook pulses thoroughly (until they are soft) as undercooked starch is harder to digest. Sprout pulses to break down many of the complex carbohydrates (read about sprouting pulses here). If all else fails, take Beano® to help eliminate gas. It is available in most health food stores, pharmacies and grocery stores. Soaking pulses to reduce the gas-producing carbohydrate content.